Since 2013 Italy is the front of the European war of tobacco to electronic cigarettes. A war fought on the media as in other countries, but at also – and mainly – on the fiscal side, through which the “dark side of the Force” in the Government (with the push of one of world’s strongest lobbies) have been trying everything to destroy the Italian vaping market. Once again today, in an interview to financial newspaper Il Sole 24 Ore, Prime Minister Matteo Renzi expressed his pride for convincing Philip Morris International to build a factory in Italy instead of Turkey. A factory which opening started with “the signature of the first stone” by Prime Minister Renzi, together with PMI’s CEO André Calantzopoulos and Italy’s GM Eugenio Sidoli. What Mr. Renzi did not say is that, to get the factory (but the official requests were never disclosed), the Italian Government had to approve specific tax breaks (50%!) to PMI’s “heat-not-burn” new product (and a raise on the ad valorem excise, which benefits high price tobacco products like Marlboro, but this is a different story), the same discount granted to e-cigs. It is more than correct to provide companies with tax breaks to attract investments, but it does not really make sense to kill a sector (and damage people’s health and companies and Govt’s pockets) for the same reasons. Basically the Italian Government is fighting a fiscal war on vaping which goes back to 2013, when a “58.5% of the final price” tax (meaning a +240% in terms of impact on consumers) and a tobacco regulation was imposed, making Italy the first country in the world to do something like this. That legislation – which was impossible to enforce – was declared unconstitutional by the Italian Constitutional Court last month. The provision also included a full ban on vaping in public places and on advertising, which were both reversed in three months. But, last November 2014, the Government – well aware of the illegitimacy of the rules (continuously struck down by the Administrative Courts) – issued a new legislation, based on an unreal equivalence between the vaping of e-liquids and traditional cigarettes, despite the absence of any scientific or industrial standard to make the measurements. The Customs and Monopolies Agency (in charge for tobacco products) set the equivalence at 5 cigarettes for 1ml of e-liquid. The consequence of the equivalence is a € 3.73/10ml consumption tax imposed on liquids (with or without nicotine) for electronic cigarettes, en force since January 2015. The Government decided to ignore the Anafe Confindustria’s (producers) warning of the wrong choice, and also any proposal to eventually impose a tax just on nicotine (which also the Constitutional Court lated indicated as the ideal scenario), which would have brought the Government what was expected. in terms of revenues. The same equivalence analysis was of about 1 heath-stick = 1 traditional cigarette, making of PMI’s tobacco product iQOS in fact less taxed than e-cig. Something unique in the world! And let’s not talk here about the fact that not even PMI excluded the possibility of smoking the iQOS instead of just inhaling it (somebody calls it “heat-and-burn”). Anyway, since then the Italian legal sales collapsed, with a -70% of the sales in a +30% growing market. The excessive taxation, and the total absence of a sound regulatory framework and of any control by the Customs and Monopolies Agency had the (wanted?) consequence of moving the market on foreign websites (now representing up to 80% of the market), with no revenues for both complying companies and stores. The same for the Government (which seems not to care…). Even Imperial Tobacco, which launched its own cigalike and an open system called JAI, and the tobacconists, are having issues with illegal sales. A situation that, together with the fight on the tobacco excise, has been keeping BAT and JTI out of the market, despite them having their own products ready. Same for PMI, which recently launched the cigalike Solaris in Spain, and is very active in the US. But Italy, you know… is the front of the “Vaping Wars” of tobacco. To summarize, two years of war on vaping costed the Italian Government more than € 200 million of missed revenues. Something that in any civilized country would have seen the people in charge of this mess fired. Furthermore, companies and stores lost possibly three times that figure, while 3.500 stores had to close and about 8.000 people lost their jobs. All this while the new PMI’s factory will be a €500 million investment and will see 600 new jobs. Unfortunately, math is an opinion when there are millions available for (legal) lobbying. 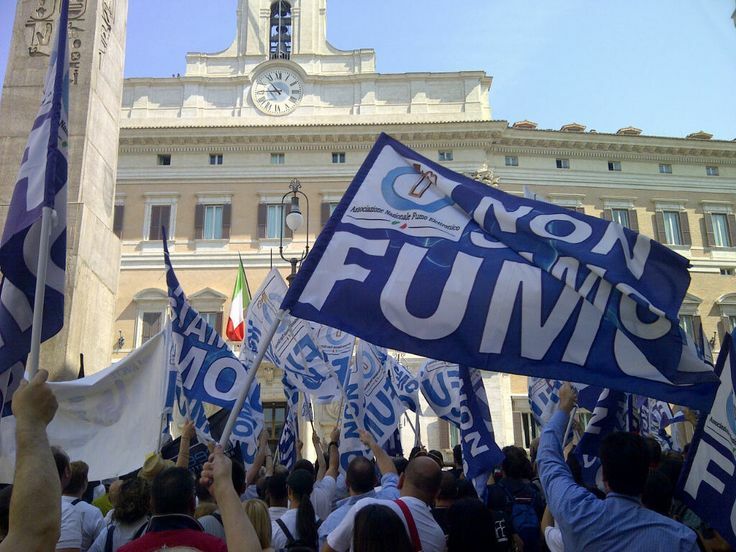 To publicly reveal this situation, all Italian associations united – producers, store owners, vapers – decided to set up a public protest on the streets Tuesday, 7 July (12pm). The day after, TAR Lazio (Regional Administrative Court) will judge the legitimacy of the legislation, with a decision that could completely change the scenario. Fort this reason, hundreds of people will gather on the street before the Ministry of the Economy and Finances, in the center of Rome (close by the Termini train station) to focus the attention of MPs – several does, of every party, are expected to attend the protest – and media on a shameful situation which is damaging everybody but one subject. Two years ago, more than 1.000 showed up before the Parliament (see picture down here) to protest against the (unconstitutional) “tobacco tax” on e-cig. But this time is the final battle. In the meantime, a group of lawyers is working on file to be introduced to the Rome’s District Attorney to ask for an investigation on the “Vaping Wars”, to understand if any felony or just unlawful action was behind them. Tag: bat, Calantzopoulos, crespellano, ecig, ecigs, electronic cigarettes, heat not burn, imperial tobacco, iqos, jti, monopolies, philip morris, pmi, poland, renzi, sidoli, tax, vaping wars. Aggiungi il permalink ai segnalibri.